SAN MARINO: Republic of San Marino is a unique little country that claims to be the world’s oldest republic. In addition to that, this is also the third smallest country in Europe after Vatican City and Monaco. Its capital, also known as San Marino, sits on Mount Titano at more than 650m above sea level, and it offers impressive views of the surrounding hills, countryside, Adriatic Sea, and Italy. It’s the main city of this country and where we spent all of our time during this trip. 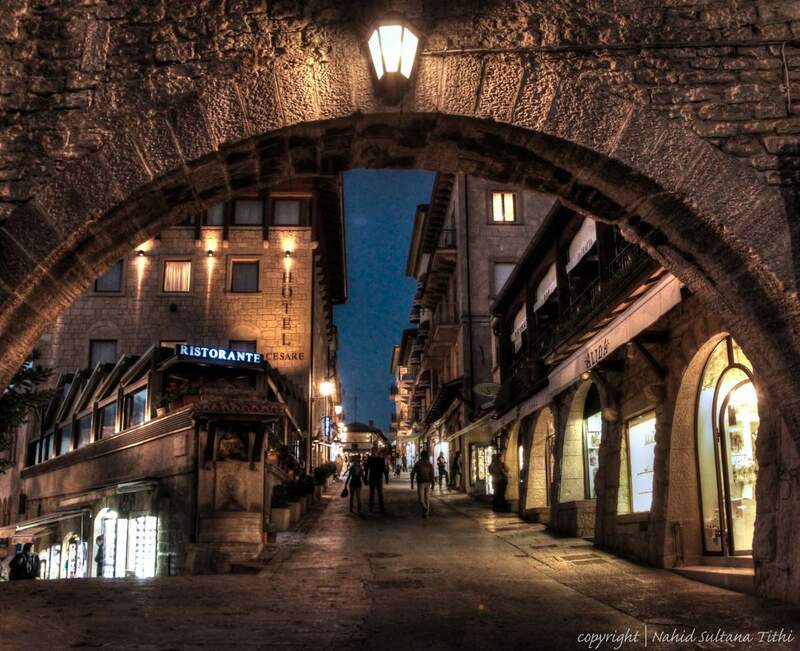 The appealing historic center along with Mount Titano is a UNESCO World Heritage site of this capital. 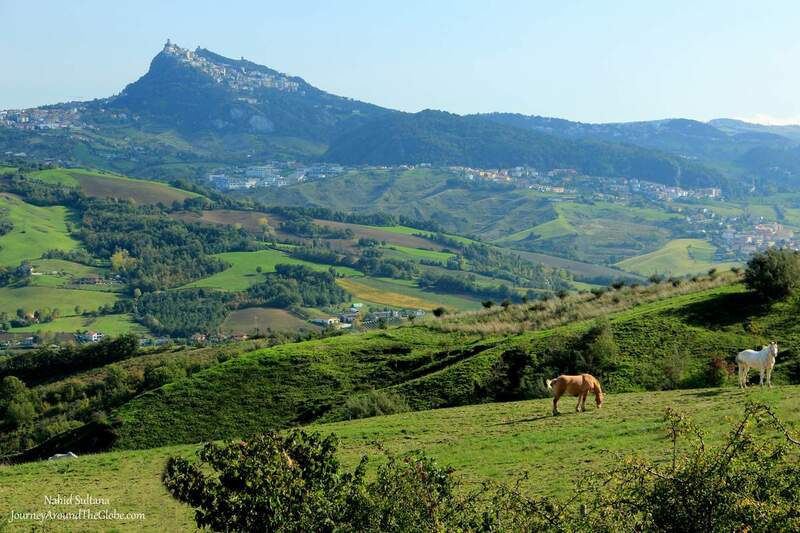 The few towns that make up San Marino are all located on the mountain sides. Mount Titano from distance where San Marino sits about 650m above sea level. TIME of TRAVEL: It was our second attempt to go to San Marino. First time we were in Tuscany (February 2012), we made our first attempt to go there, but had to return back to hotel after more than an hour drive towards San Marino due to heavy snow storm in the mountains. This time our trip to Tuscany was in October of 2013 and the weather was extremely favorable. It was a long drive but thanks to the scenic highways and roads, they kept us energized all the way. OUR HOTEL: We didn’t stay overnight in San Marino. We stayed in My Hotel One in Radda in Chianti in Tuscany, Italy and made a day trip here. It took us about 3 hours to reach here after getting lost a few times but it was worth every moment. EATING and SHOPPING: Food in San Marino is exactly same as Italy, like pasta, pizza, and gelato. We had lunch at a restaurant called Cesare Cafe exactly opposite of La Fratta on Via Salita all Rocca, right after entering the Old Town next to parking lot 6. They not only had very good food and good service, but we also enjoyed the magnificent view of the hills from the restaurant windows. Same goes for shopping, souvenirs are very similar to the ones you will get in Italy, except you don’t have to pay the tax that you will do in Italy. Old Town has many shops for leather, purses, generic souvenir items, and so on. PLACES WE’VE VISITED: Historic old city center of San Marino is very well-marked and all the sites are within walking distance. It offers spectacular views everywhere you look. All the sites here are very well-preserved, maintained, and marked clearly for everyone. 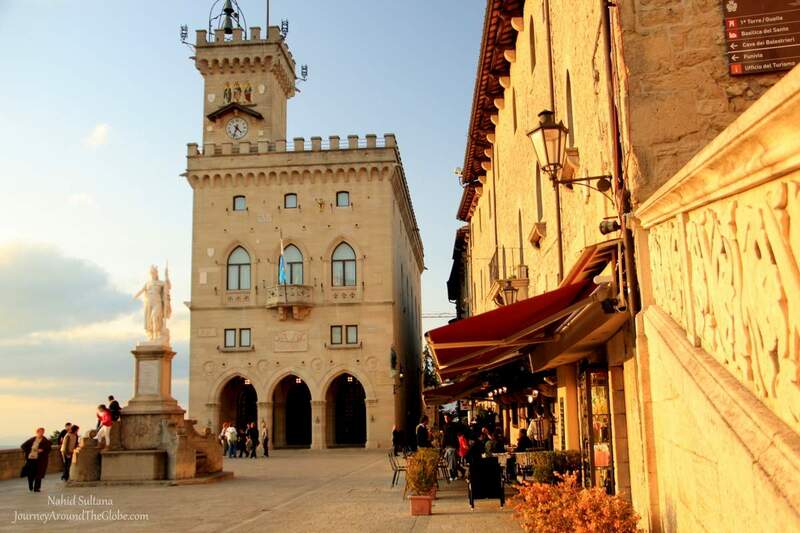 Here are all the places we’ve visited in Old Town of San Marino in a day. 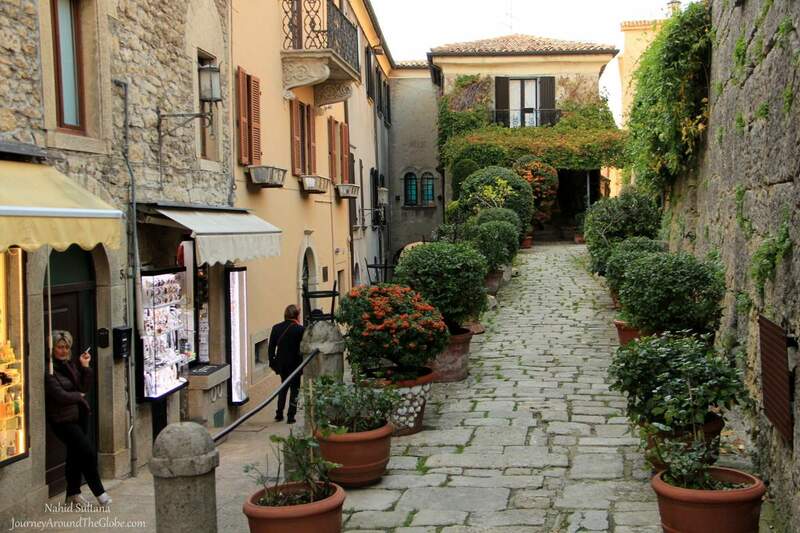 1) OLD TOWN: We spent our whole time in the Old Town of San Marino and that’s where most of the touristic sites are. Good restaurants and shops are everywhere too. Even if you just walk around the city thru its narrow streets and winding up and down ways, you will be thrilled with all the surprises you will find in this small town. We parked our car outside the wall and walked on foot taking time in each spot and enjoying the stunning views from up here every once in a while. 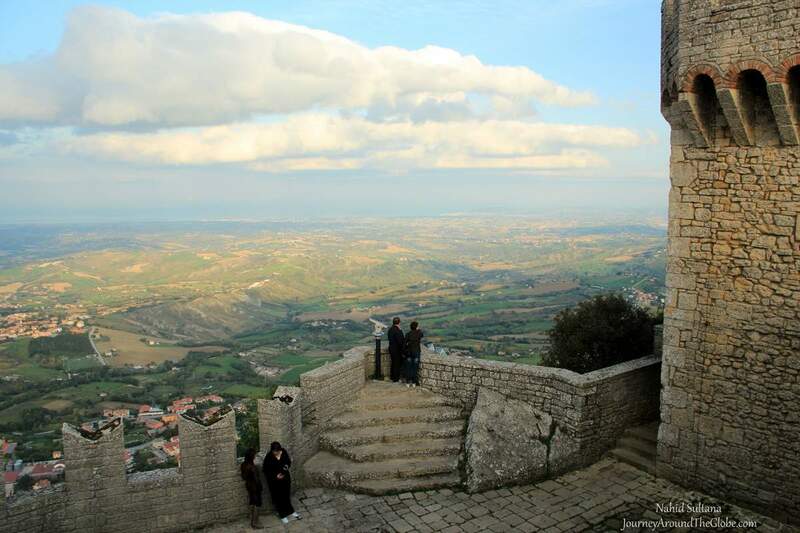 2) 1ST TOWER – GUAITA: After a small pedestrian shopping area in the Old Town of San Marino, we climbed uphill to reach the 1st We got a mind-blowing view of the encircling mountains as soon as we reached the base of the tower. 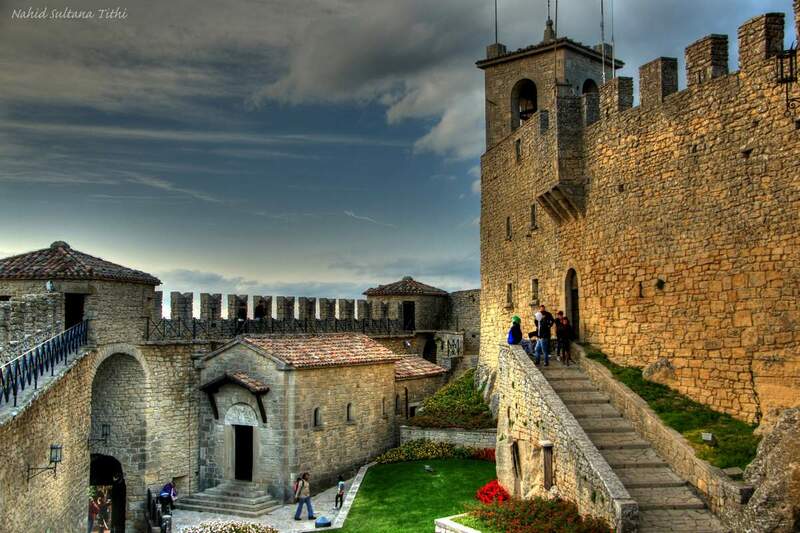 This UNESCO World Heritage site is the principal defense of Mount Titano and of the town of San Marino. The first documented record of its existence dates back to the 13th century. Over the centuries, it has been extended and modified to adapt the structure to the evolution of warfare. It also served as a prison where dangerous criminals were tortured and kept. Extensive renovations were carried out in the 19th and 20th centuries which emphasized the 15th century appearance of the building. This is the reason the tower looks so much older than similar fortresses in nearby areas. This was one of the three medieval towers of San Marino. We didn’t visit the other two towers, but they are open to the public. It is 3 euros for one tower and 4.50 euros for two towers combined. We spent about an hour here walking around the old walls and going thru few sections of this tower. 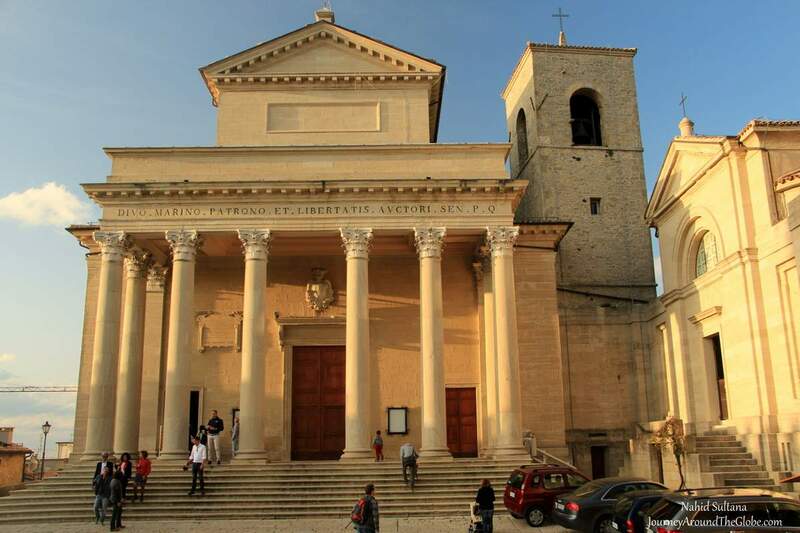 3) BASILICA di SAN MARINO or BASILICA del SANTO: About 5 minutes’ walk from the tower, in Piazzale Domus Plebis, is Basilica di San Marino. It’s main façade with Greek-style Corinthian columns, all white interior, majestic ceiling and altar, and statues on the sides of the walls inside make this place elegant and a must-see in San Marino. It is free to enter for anyone…so don’t miss the chance. 4) PIAZZA della LIBERTA or PIAZZA PUBLICA: Going down from the basilica to the left for only two minutes is Piazza del Liberta or Piazza Publica. This is a small piazza that houses the City Hall and other government official buildings. The best part of it is that you get a phenomenal panoramic view of the layers of mountains and towns below. There is a statue in the middle of the piazza overlooking the people of San Marino. It looked like this is the main square of the city and a popular gathering place for the locals. You have some lovely pics here. I’ve been to Tuscany many times but I’ve never heard of San Marino. It looks very much like my type of place. Thanks for the tip!